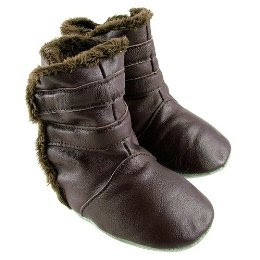 I recently was sent a pair of these Chocolate Ministar Fur Boots to review. They come in sizes S, M, L and XL. The XL is for 18-24 month olds. Even though Dexter has tiny feet for his age (19 months), I decided to get the XL. He currently wears a size 5 shoe and these are big on him. He was able to walk around in them but once the snow flies and he is wearing thick socks, I am sure they will be perfect. These beauties are made from natural leather which makes them super soft and breathable. The soles are made from suede which makes them slip resistant, soft and flexible. The fur lining is made from polyester which make them really soft. The boots also have an elastic closure which makes getting into and out of them a breeze! In my words, these boots are "big pimpin"
You can swing over to Target and pick up a pair of these boots for the amazing low price of $19.99. They come in the chocolate (seen above), beige or pink! They are distributed by RT Nash and designed by Bobux!! How would you like to win your choice of Ministar Fur Boot? All you have to do is follow me on Twitter @royaldixie and follow @ministarbaby and tweet about this contest. You can tweet as many times as you want but you have to tweet this phrase. "I want to win @ministarbaby fur boots from @royaldixie http://tinyurl.com/y9otlhr"
I follow you on Twitter... and that is how I found your site. This was my tweet for October 1st. Sorry I didn't know I was supposed to comment here. I found you through a tweet on twitter. I am following and here is my tweet! I found you on Prizey. This is a great site! I will be back. Service : Client service appeared to be impressive. Person on the telephone possessed a enjoyable approach and also I received hard cash easy. Value :I really gained a magnificent value for the reason that quick loan costs happened to be really quite low cost.